We often hear about “bubbles” in the investment and tech communities. Having shipped software for industry giants like Apple and Microsoft over the past 15 years, here’s something I’ve learned: if conventional wisdom says that something “must be a bubble,” it almost certainly is not actually a bubble. This sounds crazy, but I think I can explain. What a “bubble” actually is. 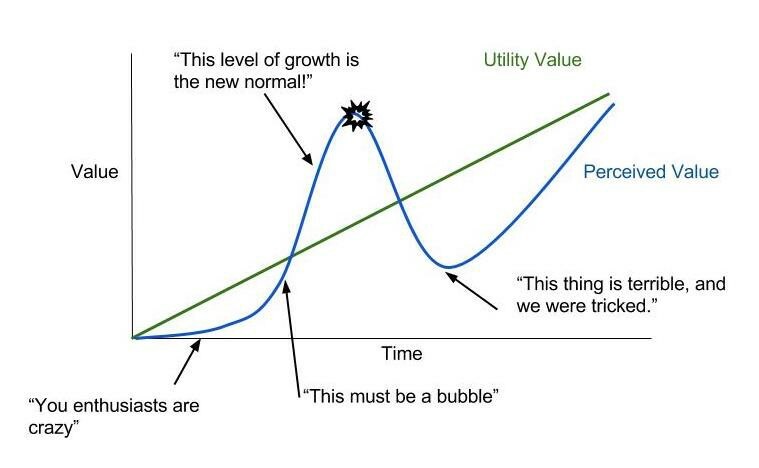 First, a definition: when we say that a market or asset is “a bubble”, we mean that it is overvalued — people are pricing that asset far above its utility value. Bubbles are the result of something Alan Greenspan called “irrational exuberance”. He coined the term in the midst of perhaps the most famous bubble in recent memory, the Dot-Com Bubble of the late 90s. When the transformative value of the internet first became apparent, it was mostly fringe elements (“nerds”) that were excited. They built crazy things, sometimes stupid things, and the larger world looked on dismissively. However, as time went on, some of these strange and even foolish looking things started to accrue value — insane value with insane growth levels. The mainstream saw this rapid growth and still didn’t get it. “It’s a bubble!” they cried. At that moment, there was no bubble. The vast majority of people were far from irrationally exuberant. They were skeptical and they actively avoided engagement and investment in “dot-com” companies because it all seemed too crazy to work. Yet still, the value continued to grow. The insane growth wasn’t created by irrational exuberance. It was something more fundamental. "It's closer to gambling than investing"
The growth continued in the face of skepticism until the world could no longer ignore it. Inexorably, the mainstream opinion shifted. Suddenly everyone wanted a piece of this massive growth, and the very people that previously decried the new trend as a bubble started explaining that, not only was this new thing not a bubble, but these levels of growth were simply the new normal. Dow 36,000, here we come! Ironically, tragically, it was at that exact moment when the bubble formed. When conventional wisdom evolved and people finally understood that the internet was going to change the world, they were correct. Unfortunately, when they assumed that the massive growth trajectories associated with the internet were sustainable, the Dot-Com Bubble was finally, truly underway. So the next time the whole world is yelling about something being “just a bubble”, and the value seems to keep going up anyway, it’s worth taking a closer look at that thing and asking where that value is coming from. If it’s not coming from irrational exuberance, there is an opportunity here. On the flip side, when some previously dismissed “fad” is becoming embraced by the mainstream — and especially if you hear supposed experts explaining how our previous understanding of limits on growth is obsolete — you may want to run away. And fast.